HomeTwo Workshop Trainings on 4/22 at Sunrose in Farmers Branch! Sorry for the late notice on here, but with the FOUR Earth Day-related green events we have done this week — we have been a little behind in our postings. 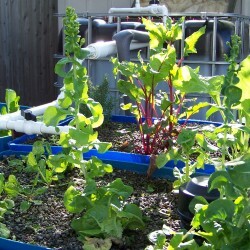 If you are interested in seeing a medium-to-large scale backyard aquaponics system (our “Sunrose” system), and attending one or two short workshops — Tomorrow is the day for you! Please email us if you plan to attend — greenphoenix@ greenphoenixfarms (dot) com. Hope to see you all! Time — 1-3pm; Cost — $5 per person. This workshop will be a demonstration that will lead you through the steps to create this DIY project on your own. We will have a completed project there onsite and we will lead you through the steps to build one yourself. You will receive a handout that will detail the necessary materials, procedural steps and some key tips as well. Time — 3-5pm; Cost — $5 pr person. This will be a demonstration workshop to lead participants through the steps to create this DIY project. There will be a completed tower there to look at and we will lead you through the steps to build one yourself. You will receive a handout that will detail the necessary materials, procedural steps and some key tips as well. We have had a few requests for us to assemble all of the pieces and components that needed to build these DIY projects, so we have put together a few kits for the Strawberry Tower that will be available for sale at the workshop – cost will be $25 each. If you would like to ensure there is one for you – please send an email to greenphoenix @ greenphoenixfarms (dot) com. Additionally, I will have a few wooden pallets extra — if I run out, I can easily get more if anyone wants them.